We've known it was a great book since Jimmy had a chance to review a pre-release copy while writing the foreword, but now it's official! 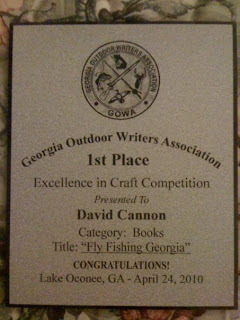 David Cannon's first book "Fly Fishing Georgia, A No Nonsense Guide to Top Waters" was awarded First Place in the Excellence in Craft Competition by the Georgia Outdoor Writers Association this past weekend. As we've mentioned here before, the book is a detailed guide to cold-, warm-, and salt-water flyfishing all over the state and includes photography by David and Stephanie Cannon and Chad McClure, along with illustrations by Tom Landreth, Bucky Bowles, Paul Puckett, and Patsy Lewis Gentry. 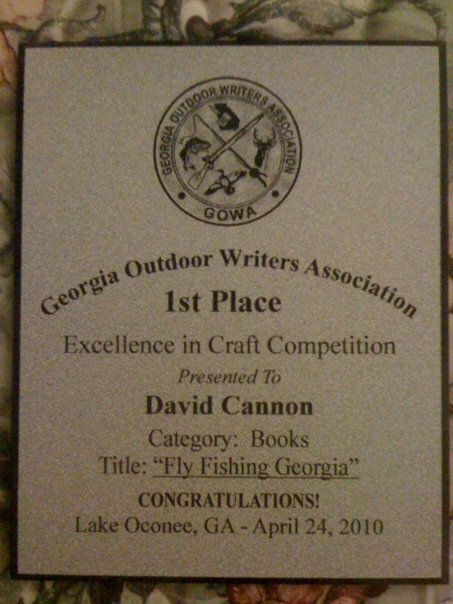 In our opinion it's the best Georgia guidebook since Jimmy Jacobs' "Trout Fishing in North Georgia". We carry the book in both stores, and if you haven't purchased a copy, highly recommend you do so!